This is a short hike on a paved path that is suitable for all ages. There are orchids naturalized on the trees as well as spectacular naturalized heliconia and floral bananas. The falls themselves are spectacular and well worth the walk. 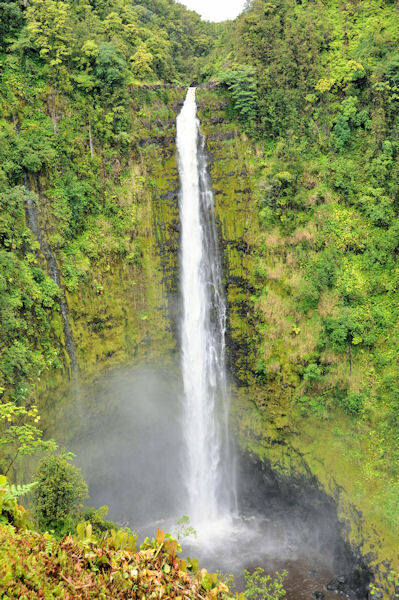 See the Akaka Falls video below for a close up of the base of the Falls. The Hilo Farmers Market is No Ka Oi (the best around!). 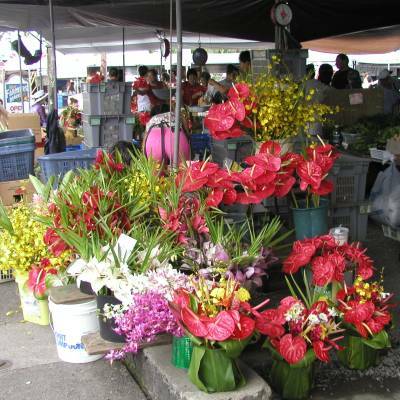 There are papayas 5 for $1, bunches of orchids and anthuriums for around $5, blooming orchids for around $6, lichi, rambutan and loong an (in season), mangoes, fresh fish, hot bread, bento lunches and all sorts of "ono" produce. As an added bonus the people there are full of island friendliness and kokua. Hale ma'u ma'u (House of the a ma'u ma'u fern), Hawaii Volcano National Park: one of the most famous craters on Kilauea. This crater, on the chain of craters road, is named for the a ma'u ma'u fern that is common nearby. Legend has this as the home of Pele, the volcano goddess, and offerings are still left for Pele to this day. 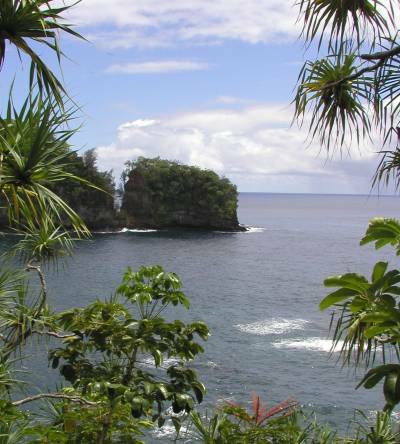 Just South of Hilo, the Panaewa Zoo is wonderfully landscaped with orchids, tropical flowers and ferns. 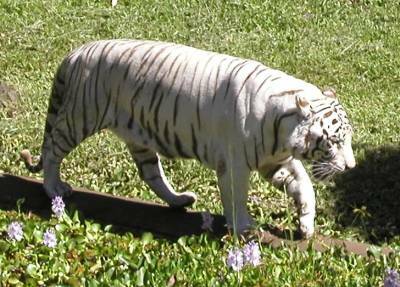 The Panaewa Zoo features a nice variety of animals from throughout the tropics including a very friendly native Nene Goose (endangered list) and a beautiful white Bengal tiger (shown). 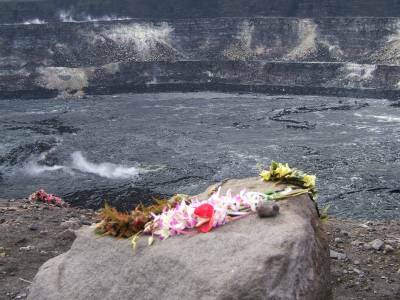 The Ahalanui Hot Pond is South of Hilo off of the Kapoho-Kalapana road. These ocean-fed, natural hot ponds are public accessible with parking and shower available. After a hard day of sight seeing, the ponds provide a relaxing soak, all within sight of the surf just outside the pond walls. 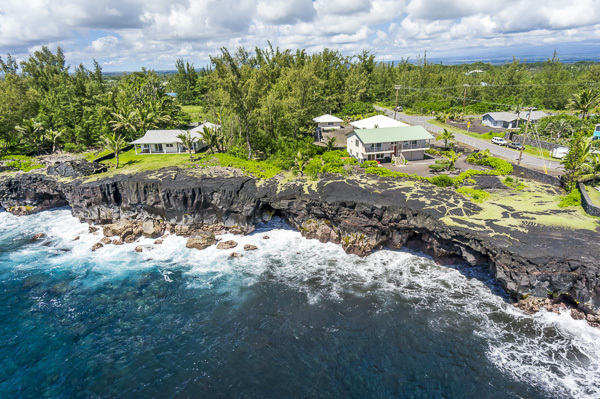 Kaimu beach is South of Hilo off of the Kapoho-Kalapana road and lies on top of what used to be the beautiful, coconut tree-lined Kalapana black sand beach. There is a new black sand beach forming along the ocean as well as a large grove of fledgling cocounut trees. Local rumor has it that an elderly local woman's dieing wish was that the lovely cocounut groves of Kalapana one day grace a new black sand beach at Kaimu. 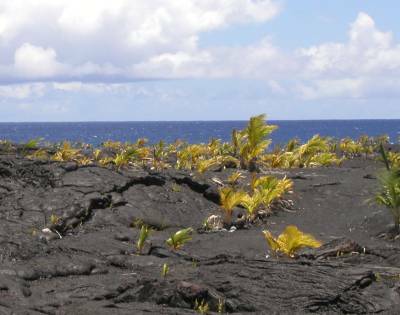 In respect, residents have carried coconuts across the lava field and planted them in the sand, forming the beginnings of a new Kalapana. Captain Cook was initially mistaken for the god Lono, having arrived at Kealakekua Bay in large ships with white sails on the Makahiki. However, after a disagreement over a stolen skiff, a fight ensued resulting in many deaths, Captain Cook included. 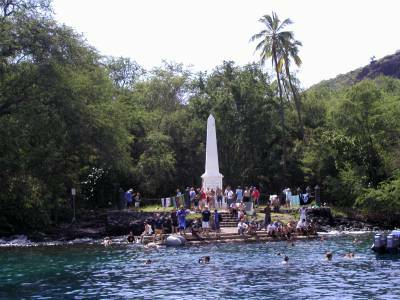 The bay is now a memorial and a fish preserve with dive tours being run out of Kona. The diving is spectacular with large schools of tang (Palani), wrasse, parrot fish (Uhu), Jacks (Ulua) and A'hole hole. Just off of Kapoho Road, Lava Tree Park features a short trail through some of the most dramatic lowland Koa forest still in existance. 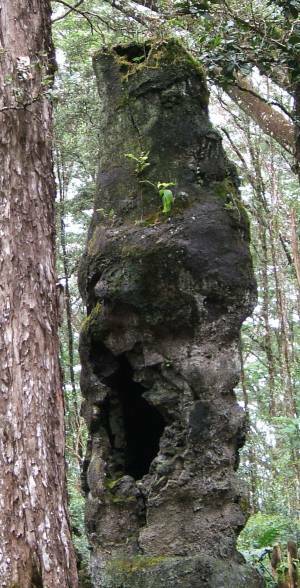 As if that weren't enough, huge lava pillars mark the spot where giant trees were once burned and then petrified by hot lava flows. 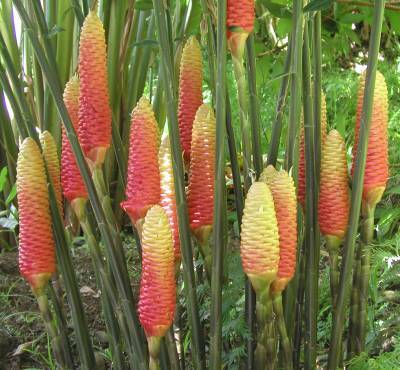 A variety of lush flora thrive here including bamboo orchids, wild begonias, taro and heliconia. 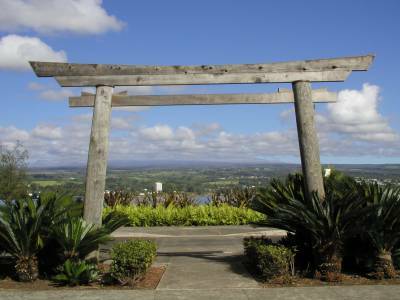 In the hotel loop along the Hilo waterfront, Lilioukalani Gardens provides stunning views of Mauna Kea (white mountain) amid lush landscaping, huge banyan trees and panoramic views of Hilo Bay. 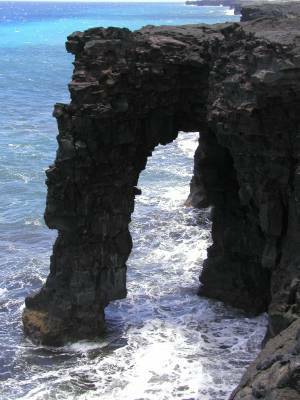 Birth place of King Kamehameha I, North Kohala features rugged cliffs, beautiful beaches and lush wind swept valleys amid a quiet artist colony atmosphere. On Crater Rim Drive in Hawaii Volcanoes National Park, lava once flowed through these walls, forming the cave as the hot lava receded. 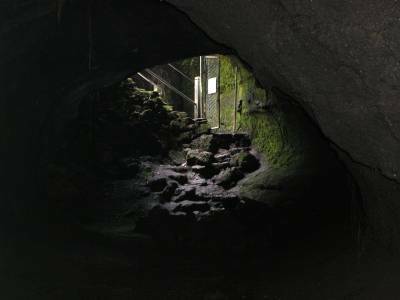 The main part of the cave is lit and features a dramatic, fern-lined entrace. The tube continues on (shown) to an unlit section which requires flash lights and a raincoat. The Onomea Botanical Gardens features a huge collection of varied and mostly gorgeous heliconia, palms and other tropical foliage. There is a relaxing lilly ponds, complete with resident bull frogs as well as a nearby stream with native O'opu and Malaysian prawns. A short but lushly planted trail down to the ocean, Onomea trail used to be the entrance to the Onomea Botanical Gardens before the new parking area was made available. This little hike features stunning vistas and ends on a quiet stream-fed pool with grey-blue Malaysian prawns ambling peacefully. 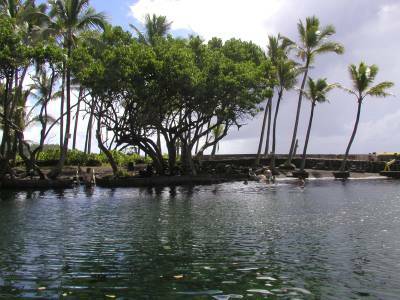 A small earth barrier separates the pond from waters of Onomea bay, where you can see a well known landmark, two jagged lava teeth rising from the surf. Onomea trail is just South of the entrance to the Onomea Botanical Gardens. Look for the landmark sign and the cars parked by the side of the street. Richardson's beach is great for families or a quick jaunt to the beach but if you just want to get away from it all, Kehena is the place for you. 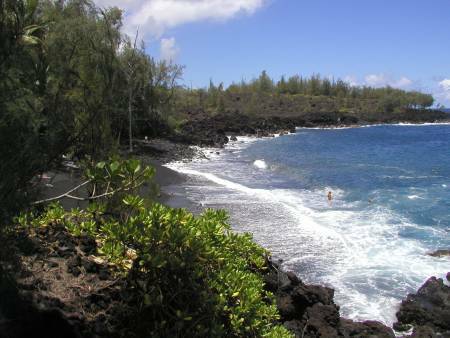 Kehena Beach is a wonderfully secluded black sand beach hidden below a short sea cliff. Fishing, swimming and sunbathing. Clothing optional. About 3 miles east of Kaimu along Highway 137. Look for the cars parked along side the road. 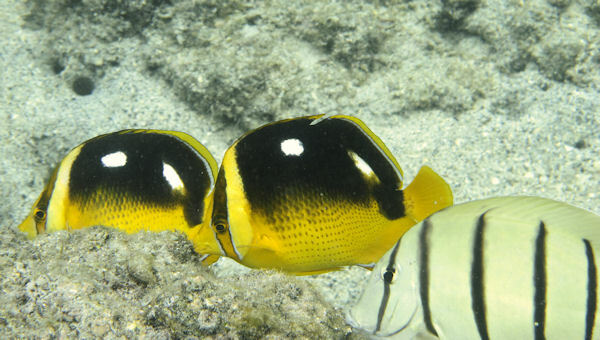 A protected baylets with warm, calm water that is great for swimming in. 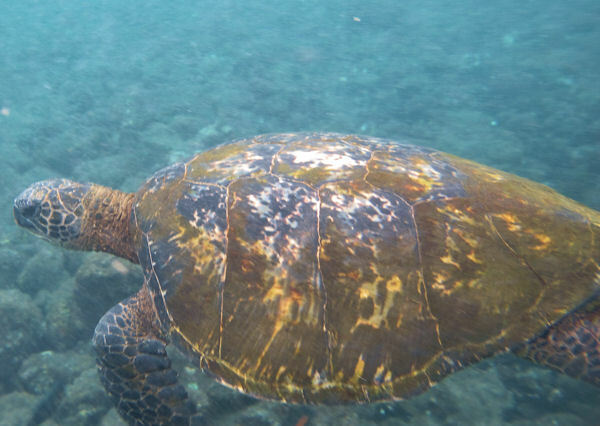 There are also occasional turtles (Honu) although less of them in recent years. Swimming, snorkeling (some fish but no coral, likely due to the fresh water outflow) and fishing. Beware of strong currents near the sea-side edge. 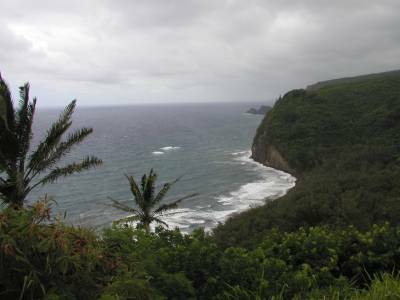 Follow Highway 137 to Kapoho and follow Vacationland Drive to the ocean if you have a pass. 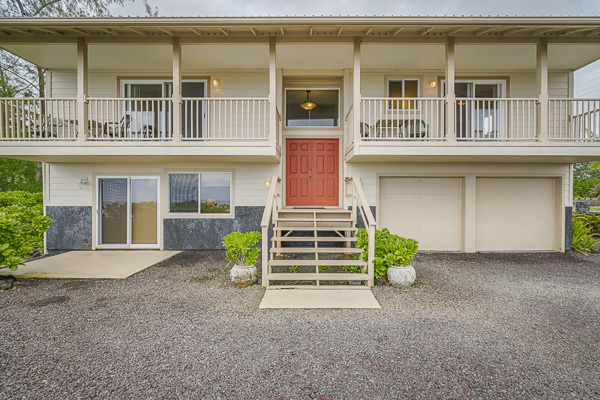 As this is a gated community and they have posted no parking signs outside the gate, you can either stay at one of the vacation homes in Kapoho or go along the coast from the lighthouse to get here. 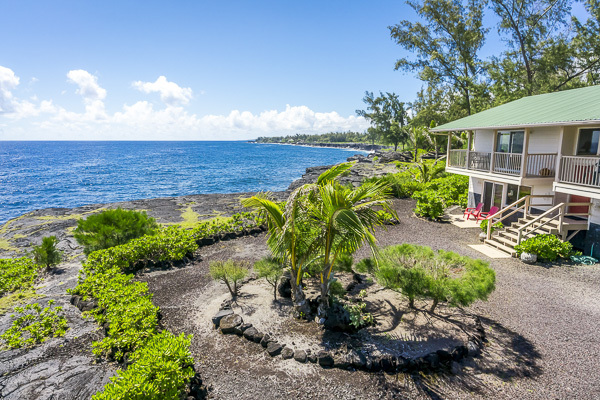 A protected bay with breakwater, boat launch and wonderful volcanically heated water. Good surfing in the winter in the inlet. Also good for snorkeling, jumping off the pier or just plain hanging out. Keep going down the 137 Kapoho Kalapana road toward Kalapana until the road turns to the right and forks; the boat ramp will be straight ahead. Follow highway 11 up from Hilo to the Crater Rim Drive in the Hawaii Volcanoes National Park . 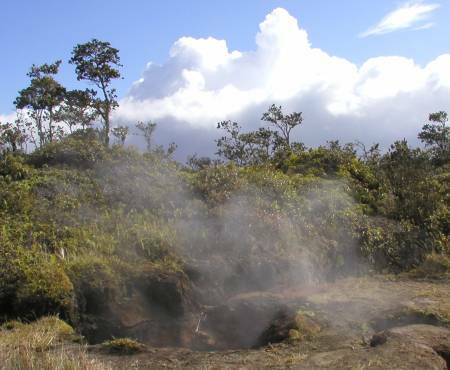 The steams vents are visible from the road and there is a nice path in where you can see a number of volcanically heated steam vents amid the Ohia Lehua, ferns and numerous bamboo orchids. Kilauea was pouring lava into the sea when I snapped this picture. If you want to see molten lava, the best bet is to monitor the USGS website to see if there is a current eruption in progress. During my last visit, the lava was glowing up high on the slopes of Kilauea where it had been flowing down the lower slope of one of the cinder cones. However, if you follow highway 11 to the Hawaii Volcanoes National Park and head on down to the ocean on the Chain of Craters Road, you can see this former eruption site and look at the really cool shapes in the pahoehoe lava that glisten with a silvery silcon mirror-like shine which will set your imagination going. There is a ranger station at the lava zone with an informative video, lots of helpful illustrations and a shady picnic bench if you want to stop for a bite. Be prepared with sunscreen, comfortable, grippy walking shoes to go over the lava, water and a good hat. Walking poles are advisable for those less sure footed among us. On the walk out to see the Kilauea Eruption (see above), you will also see this dramatic lava archway, carved out of the lava by the pounding of the waves across thousands of years. 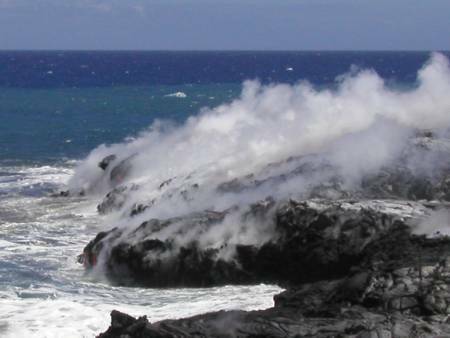 This is a series of lava pools connected to the ocean. Wai 'Opae has some of the most spectacular coral on the Big Island, possibly because of the warm, protected waters. Most of the pools are reasonably shallow (standing depth) with a few going down about twenty feet in depth. There are exceptional examples of plate coral, all sorts of butterfly fish, wrasse, tangs and other fish. The water is clear and fairly calm. You can skin dive down the coast for quite a ways and it is all spectacular. 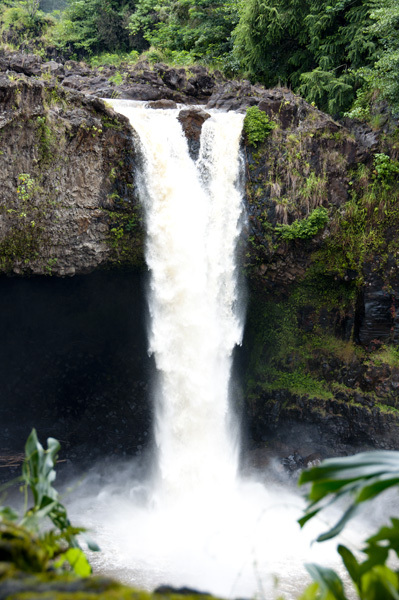 The falls are a short drive from Hilo (just uphill), easily visible from the parking lot and are spectacular. While not as big a vertical drop as Akaka Falls, the sheer flow of water is amazing. On a sunny day, the mist at the bottom of the falls makes a wonderful rainbow. 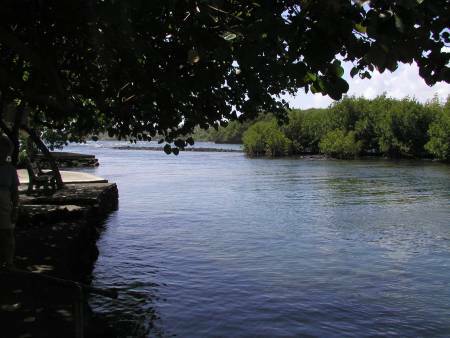 This wonderful black sand beach has shady coconut trees, a small concession, a pond with ducks and turtles everywhere! If you want to see turtles, go to Punalu'u Beach. 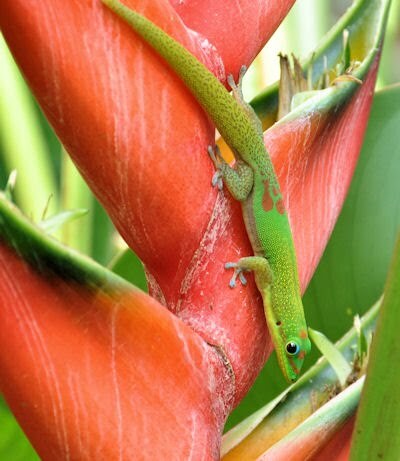 Punalu'u Bakery has wonderful tropical gardens including a waterfall and exotic tropical plants (shown, a heliconia with Madagascar Day Gecko), a covered outdoor eating area, sandwiches, fresh bread in multiple flavors (taro, rainbow, etc. ), and more flavors of malasadas than you can shake a fist at. For the uninitiated, malasadas are deep fried dough rolled in sugar. However, these are light and fluffy with several varieties of dough and oh so ono (tasty) fillings such as custard, chocolate and taro. 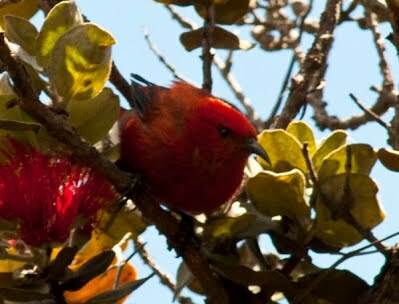 If you want to see native birds and especially Apapane and Hawaii Amakihi, this is a great place to go. The trail is very accessible and the birds visible right in the parking lot. Look for an Ohia tree full of blossoms and just wait for birds. Shown here: Apapane on Ohia. 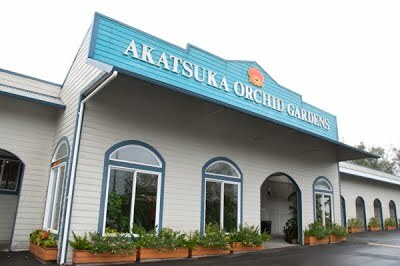 Akatsuka Orchid Gardens is a nice place to stop on the road back from Hawaii Volcano National Park. They have a broad selection of orchids in all shapes and colors and they will ship back to the mainland.